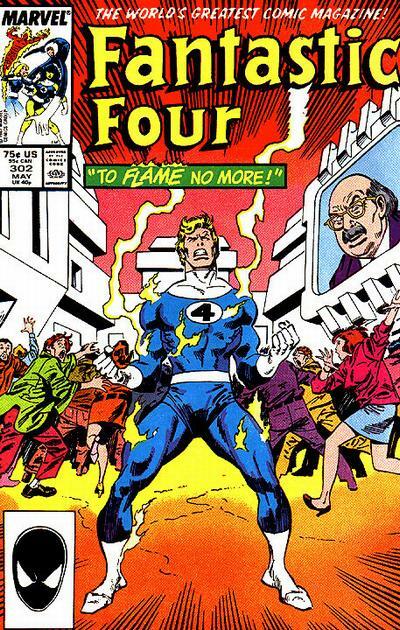 Reading the Fantastic Four comics from the start. Now that Johnny and Alicia (who is secretly Lyja the Skrull in disguise) are married, issue #302 spins them off into their own adventure. While on their honeymoon in upstate New York, Johnny and Alicia are headed to the town of Athenvillie, where they are stopped by Army soldiers. The soldiers won’t let them pass until they realize Johnny is the Human Torch. They then claim this was only a training exercise, which Johnny doesn’t believe. In town, Johnny and Alicia learn there have been a bunch of disappearances, which some people blame on the increased military presence. They meet with Alicia’s friend Myrna and the local Marshal. (Upstate New York is a lot more like the Old West than I thought.) Turns out many of those who’ve disappeared were local artists, only for them to return days later, wandering the streets with no memory. Back at Four Freedoms Plaza, Reed continues to experiment with (on?) Franklin, determining just how Franklin’s dream-based astral projection works. Franklin’s dream-self spies on Johnny and Alicia for a moment, where Johnny says he’s going off by himself to investigate the disappearances. At HQ, Ben gripes at Reed to not let Franklin become a peeping tom. The point gets across, as Reed, Sue and Franklin sit down for a talk. Johnny visits the army camp and talks to a cigar-chompin’ captain. The captain doesn’t want Johnny there, but then Johnny overhears another soldier talking about missing nukes. Before he can investigate further, he sees an FF signal flare in the sky, recognizing it as the one he gave Alicia in case of emergency. Johnny flies back to where he left Alicia, but she’s already gone. Her friend Myrna catches him by surprise, gassing him unconscious. Johnny and Alicia wake up in a town-sized underground facility called Project Survival. Johnny can’t use his powers because he’s covered with a special anti-fire solution. Myrna is there, and she introduces them to the project’s inner council. 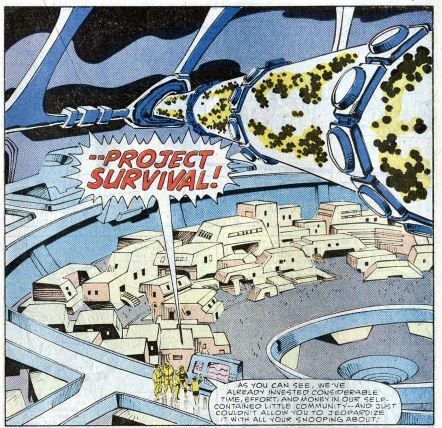 Project Survival is basically a giant bomb shelter/spaceship hidden inside a nearby mountain, collecting humanity’s best and brightest, with a plan to escape the Earth when or if World War III starts. 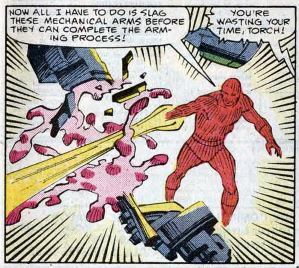 Johnny asks the council about the stolen nukes, saying they could use the nukes’ firepower to blast off and escape the earth. The council members say they would never do this, fearing that would start the nuclear war they fear. One man, known only as “Tech,” admits to the theft, saying it’s time for Project Survival to leave the Earth. Tech summons the guards and locks up Johnny and Alicia. Johnny concentrates, managing to get his power back. He flies through the place, dismantling the engine mechanics without harming or setting off the nukes. Later, the cops arrive and haul off Tech and the inner council, while Myrna and the rest of Project Survival wonder what to do now. 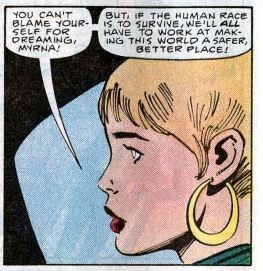 Alicia (secretly a Skrull, let’s not forget) gives a big speech about how nuclear war can be prevented, but only if all humans can work together and whatnot. Fade out: Sue is in the room while Reed experiments on Franklin, but she doesn’t say or do anything. Clobberin’ time: Look closely: Ben is reading a book titled “How to Pick Up Girls.” Make of that what you will. Flame on: The air grows colder around Johnny as he does he concentrates on bringing back his powers, suggesting that he’s gaining strength by drawing heat from the air around him. I don’t recall him doing this before. Four and a half: This issue raises the question of how far Franklin can travel when in astral form. Here he travels across state, while in Power Pack he mostly just traveled around NYC. The Alicia problem: What to make of Lyja being the one who gives the big “humans can save the Earth” speech. Does this show how much she’s come to care about the Earth since she’s been here, or is she merely maintaining her cover? 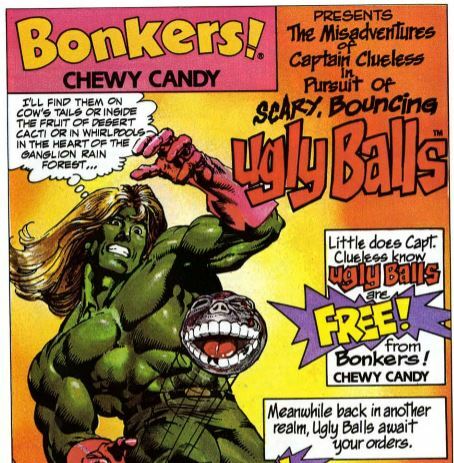 Commercial break: Whatever happened to Captain Clueless? Trivia time: A note on the first page says, “Thanks to the folks at Omacon 6 for all the story ideas.” What happened here is that co-writers Tom DeFalco and Roger Stern allegedly gave a “how to write comics” presentation at a convention in Omaha, Nebraska, where they plotted this whole issue live on stage, complete with suggestions from the audience. Fantastic or frightful? A zero substance issue, the usual mysterious small town/underground sci-fi facility story we’ve seen before. Tacking on a heavy-handed anti-nukes message makes it more groan worthy than deep and meaningful. Not a bad issue, just a forgettable one. Next week: Bring the thunder!